Salon's coffee art contest: Our daily shots! When we kicked off our little latte art contest last week, we thought it'd be fun ... but we had no idea how many responses we'd be getting! So, to keep inspiring great shots, pours and pictures, we're going to run one of our favorites each day until the deadline of April 6. Fun fun! And keep them coming! From Jesse Raub, from Intelligentsia Coffee in Chicago, with a note: "Latte art is created mainly by two different methods — free pour, and etching. Free pour relies on the flow rate and textural quality of the milk to create a design, while etching involves using an implement to draw designs in white foam with dark coffee stains. 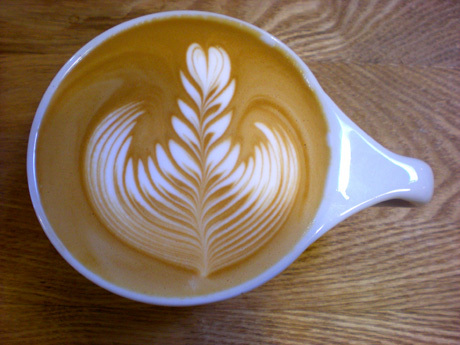 The three main designs people associate with free pour latte art are the rosetta (pictured here), a heart, and a tulip." Snap some pictures of your favorite baristas' latte art skills and send them to us. We'll pick our favorite shots, and the top five entries will win fabulous prizes from Bodum, makers of super sweet, design-y coffee gear. Four winners will get a set of Canteen insulated glasses (made of lovely-to-hold, super-light borosilicate glass – no, I'm not shilling; I just date an architect who gets really excited about cool materials). One super-extra winner will get the Canteen glasses and a classic Chambord French press. And, if you'd be so kind, please go and "Like" Bodum's Facebook page. Yes, I am shilling now, but they're kind enough to hand out some sweet prizes for our goofy little contest, so why not? Photos should be 400x600 minimum size, 72 dpi, but bigger is better. Please put "Foaming at the mouth" as the subject line of the email. And please know that by sending these photos in, you're agreeing to give us permission to publish them on Salon. All entries must be received by 1pm, Eastern time, Wednesday, April 6th, 2011. Winners will be announced Monday, April 11th.